Your words enrich my photos…thank you!! Your photos enrich my words…thank you!! I am reminded of the time when my father first moved in with us. We didn’t understand how tired the leukemia made him, and he seemed frail and a bit addled. He kept telling us he saw a bobcat, and frankly we did not believe him. In time we learned his eye was as sharp as your wife’s. Even in them midst of hid decline, he could see things we simply missed. Thank you for the reminder of what he meant to us, particularly in those last few years. Oh, and you may want ot copyright the photo as well. Really nice photo and thoughts! I especially liked seeing the bobcat because Shirley’s sister talks about them near her house off Los Osos Rd. all the time, but nver had a picture. Thanks, Steve. I think it’s a great photo. We saw this bobcat when we first got out of our car at the trailhead, but of course, he/she scampered off before we could get very close. 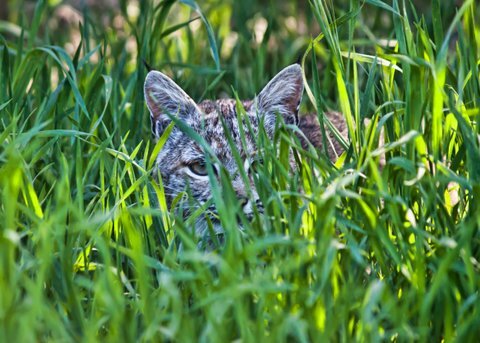 It was when we returned later the same way that we spotted him/her silently peeking through the tall grass! Thank you for liking my postcard fiction! You are a wonderful creative team. Inspirational. Thanks, Marlene. It’s nice to know you enjoy my blog. It would be great to see you. Please stop by sometime. Thanks for your kind words, Cynthia. I look forward to reading more of your blog too.